Growing up, I went through a phase when I was eating up all the information I could about magic tricks and illusions. While I become a world-famous illusionist (which is what I wanted to be), I still take delight in anything that promises to add a bit of magic, literally, into my life. Luckily, there are several locations locally that provide thrilling experiences in the art of illusion. You don’t even need to say “abracadabra!” to take a look at the magical side of Austin. Esther’s Follies, starring Ray Anderson, is one of Austin’s famed places for tourists and locals to visit. Its premiere troupe has been around for over 40 years, and provides audiences with a healthy dose of side-splitting comedy, fun musical numbers, and–my favorite–dazzling Vegas-style magic acts. From magicians escaping life-threatening situations, to levitation, to making objects appear, Esther’s Follies has a variety of illusions to keep you wondering how they did it. The venue hosts shows three nights a week, Thursday through Saturday, with two shows each weekend night. Hidden away in south Austin, Magic’s Theater & Museum focuses only on the art of illusion. The magician, John Magic, performs two shows a week on Friday and Saturday. Friday’s show is for adults and is more intimate, with close-up magic that features illusions with cards and coins. Saturday’s show is open to a large audience and features stage magic, like cutting a person into thirds, levitation, and making things appear. You can also tour the museum that contains fun collections of magical pieces, like a replica of Harry Houdini’s famous Chinese water torture cell, and Doug Henning’s personal wardrobe and props. And since it’s BYOB, I’ll be downing a bottle of moscato with friends on my next visit. If you have kiddos who are interested in magic, they can get involved with a local Austin magic camp that runs over winter break, spring break, and during the summer. Fantastic Magic Camp just celebrated its 25th anniversary, and is targeted to teach children ages five through 12. I would have gone crazy over this when I was a child because campers get to learn and perform a variety of fun things, including juggling, puppetry, and magic tricks. Another fun perk? 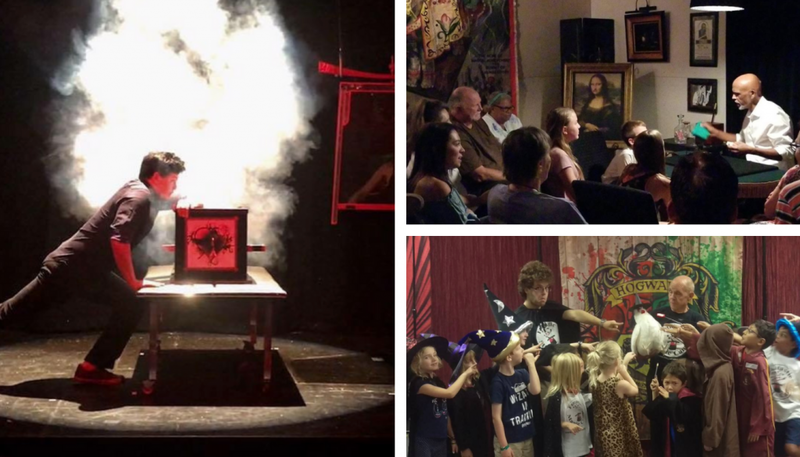 Campers get to see four fun shows that showcase Texas magicians, jugglers, and ventriloquists–friends and family invited! The next camp starts on Dec. 20, 2017, for the winter break. What magic tricks do you look forward to seeing the most?